Our first impression of Xi'an (pronounced Sian) was amazing - modern, attractive buildings and an abundance of high end designer shops. Xi'an is an ancient capital and was the home of the Ming Dynasty in (1368-1644). It is surrounded by a 40ft wall which borders the ancient centre. 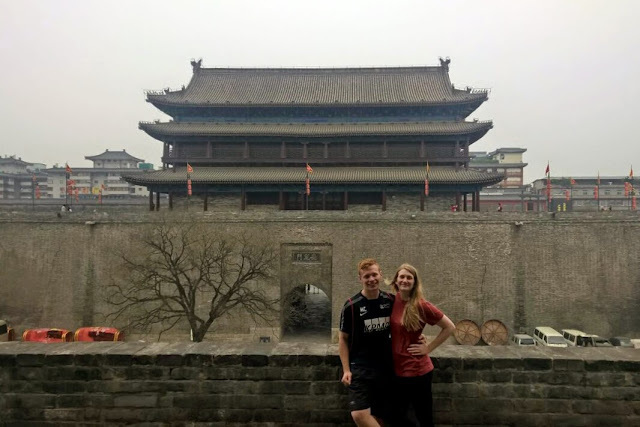 Jim, our Dragon Trips tour guide, told us the history of the wall and how it has been destroyed and rebuilt countless times in China's history as the Dynasties battled it out. As an introduction to the city, we climbed onto the walls and hired tandem bicycles to cycle their loop - which was in excess of 10 miles! The walls still had their ancient charm and were very bumpy to ride on! The strangest part for me was the fact many of the buildings within the protection of the walls were now taller than it, a striking comparison to how it would have looked when initially built. The walls are now adorned in flags and pretty buildings, designed in the classical Chinese style and so look similar no matter where on the wall you are. This lead to several members of the group handing their bikes in several miles too soon and having to beg for them back! In the main entrance, we saw a group of Chinese people on a team building trip. They were doing some form of team building exercise that involved group massage. This looked really fun and as a group we decided to try it. 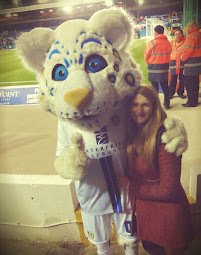 As soon as the Chinese people saw what we were doing they invited us to join in with them. We had no idea what we were doing, but it was fun to try a Chinese team building activity and talk to some Chinese tourists! Following this, we headed to the Muslim Quarter. Xi'an has the highest percentage of Muslims in all of the Chinese cities - the main religion is most of China is Buddhism. 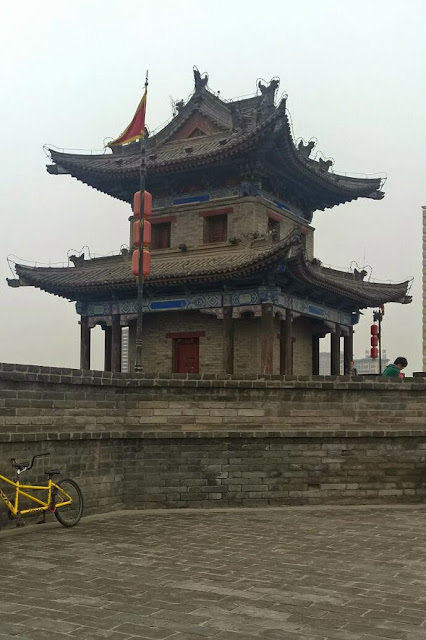 At the front of the Muslim Quarter is the Bell tower and the Mosque, both pretty buildings, but behind them is where the real Xi'an can be found. Tiny alley ways that buzz with excited tourists and locals buying and selling things. The Muslim Quarter is renowned for the best street food in all of China and there was certainly plenty to choose from. Being a vegetarian, street food scares me so we found a Muslim restaurant to eat dinner in. Matt got the worlds thickest noodles, but still hasn't grasped his chopstick technique. When the manager saw him struggling to eat the noodles, he came over, mixed and cut his food up, then gave it back to him. Yes, the manager cut up Matt's food. I loved this entire day in Xi'an, but the walk home was potentially the best part. I love the way cities come alive at night and I love the way famous attractions are appear to glow with all of the lights which surround them. 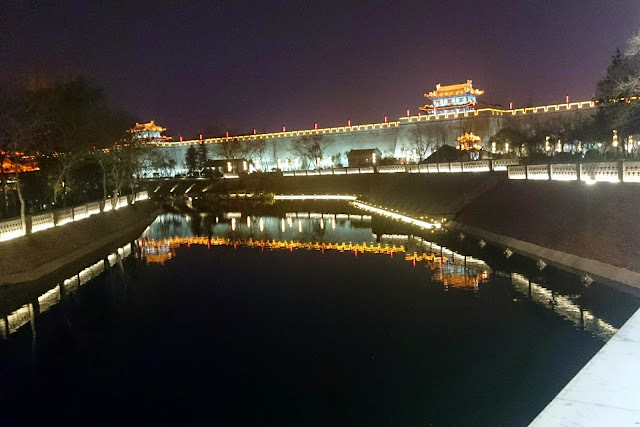 Walking back to the hostel alongside the Ming Dynasty walls was beautiful - the reflection of the orange glow of the wall could be seen in the river that runs parallel to it. The parks were buzzing with old and young alike walking their dogs, exercising or just having somewhere to go and talk. This is the best looking city at night that I have seen so far in Asia. 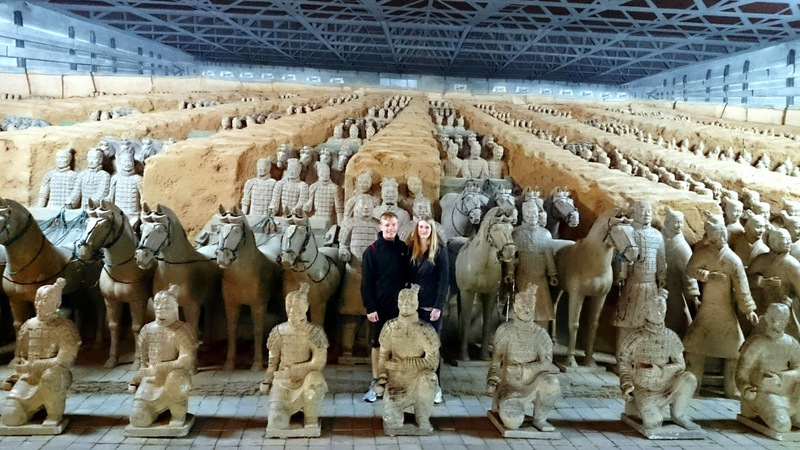 The next day was an early start for the real reason we were in Xi'an - The Terracotta Warriors. Around 200AD, Qin Shi Huang, founder of the Qin Dynasty, ruled a unified China as its first emperor. Amongst several massive building projects he ordered during his reign (the Great Wall being one of them), his most memorable project was the Terracotta Army he constructed. He was buried guarded by an army of more than 6,000 life-sized terracotta solders which required over 700,000 men to complete. 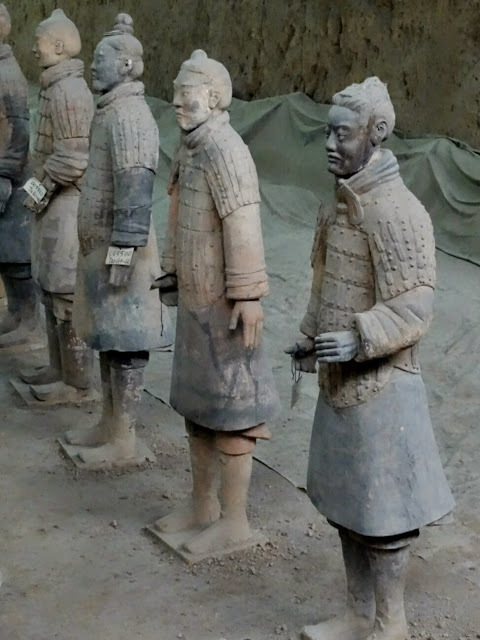 Almost 2000 years later, three farmers digging a well found the first Terracotta Warrior. In the last 40 years, 8,000 Terracotta soldiers, 130 chariots with 520 horses have been found. 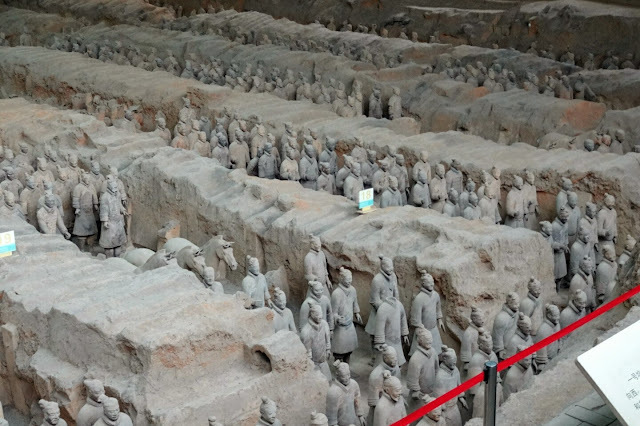 The Terracotta Warriors are now thought of as the 8th Wonder of the World and the certainly lived up to expectations. Their vast number and ingenious detail was astonishing - each warrior has a different face and different details and nails! The complex which holds the warriors was very different to how I imagined it, it is very touristy and designed to keep even the most uninterested tourist occupied. This was the first place in China we have seen a large collection of Westerners in one location, which was a bit of a shame as it could have been a lot more authentic, as a lot of the other attractions are. Just as we decided to leave the complex, the heavens opened and the rain poured on us - soaking our clothes, shoes and hair. With this turn in weather, the temperature decreased substantially. 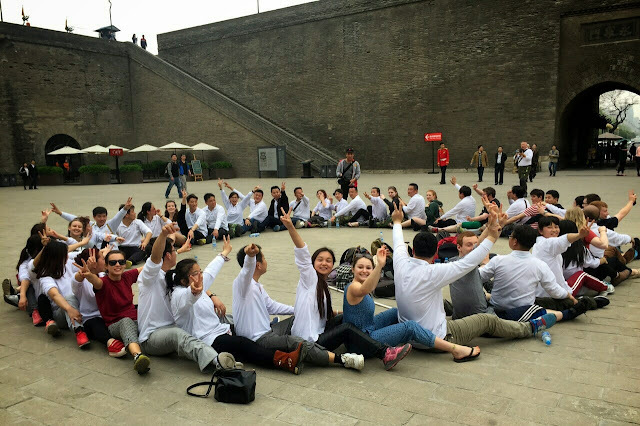 I think the heat wave may be over, let's hope it warms up for Beijings wall camping!